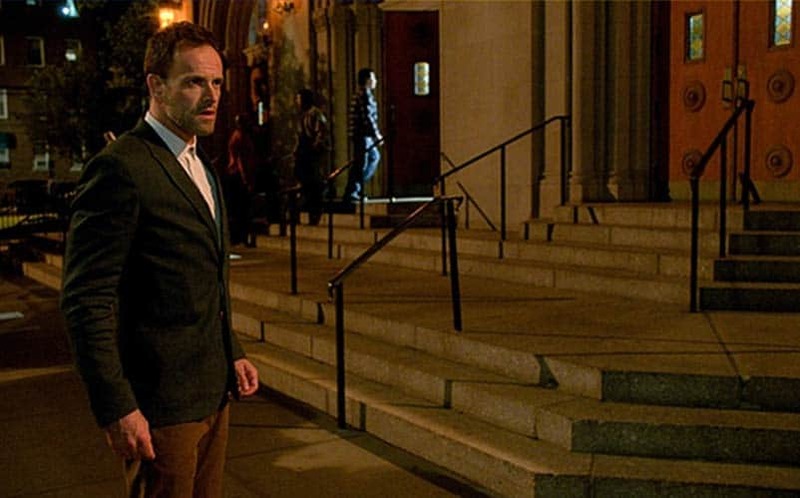 Elementary "The Past Is Parent" Review | Nerd Much? 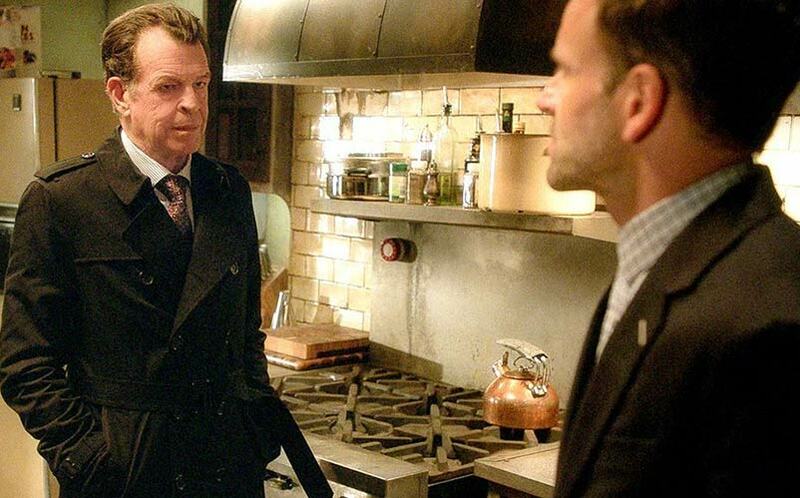 After all the hype surrounding the casting of John Noble to play the role of Sherlock’s father, this episode of Elementary, “The Past is Parent,” felt slightly underwhelming. The audience spends much of the time wondering, like Sherlock so often does, if Mr. Holmes will actually show up. We are rewarded at the very end of the episode when Sherlock ventures up to the roof of the brownstone, and we see the back of the elusive Morland Holmes. He dramatically turns to face his son, and witty banter ensues for the remaining seconds of the episode. This effect of this scene may have been much more powerful had the audience not known about John Noble all the along. Still, one can’t argue with the casting; I can’t think of a more perfect actor for the role, and there is an undeniable resemblance between Noble and Jonny Lee Miller. Considering it takes place on the heels of Sherlock’s relapse, this episode opens on an appropriately grave note. We see two young, and apparently dead, women covered with blood, and Sherlock sitting on a dresser with blood on his hands, pondering the ghastly scene before him. This show loves to make us wonder whether he has finally crossed that fine line between friendly sociopath and murderer. When a phone rings and one of the girls awakens to answer it, however, we discover that he is simply recreating an old crime scene in an attempt to solve a murder. The scene then quickly takes on the lighthearted tone we are more familiar with from the show. We then see Joan attempting in vain to reach Sherlock, to warn him of his father’s impending arrival. He doesn’t, of course, and the audience finds themselves sympathizing with Joan’s frustration. After all, as mentioned before, the casting is not a surprise. Can we just have some John Noble already? It’s also worth noting that there are some definitely parallels this role and the similarly estranged father Noble plays in Fringe, although Morland has a much more malicious feel about him than the eccentric Walter Bishop. 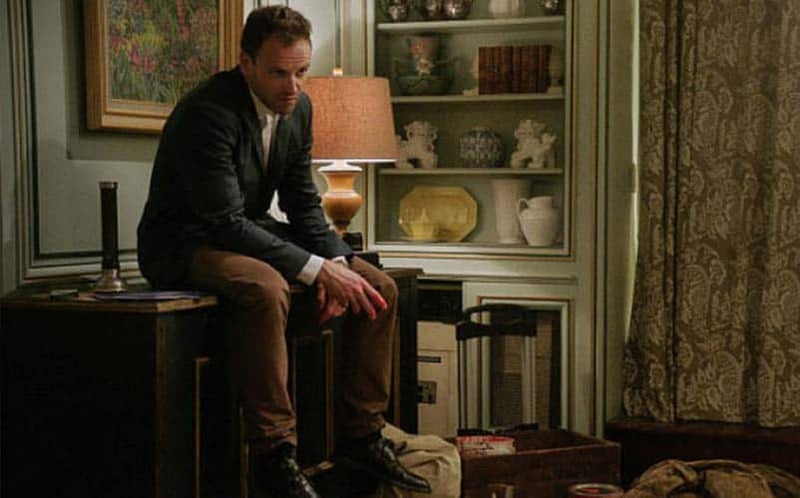 I’ve always enjoyed the way Elementary takes Sherlock Holmes’s drug use from the books and spins it into a full-fledged drug addiction in the show, as well as the inclusion of a twelve-step program. All though we were all rooting for our hero, he was presented in the beginning as a recovering addict, so it was only a matter of time before addiction reared its ugly head. I would have liked if they played up that aspect a bit more; his falling off the wagon almost seems like an afterthought in this episode. It scarce has any notable effects on him or his work, as the main concern seems to be whether he will be charged with assault for his attack on Oscar in the season finale. On his way to a meeting, Sherlock is confronted by Jonathan Bloom, the man he and Joan visit in the previous episode who provided Oscar’s sister with drugs. In case you don’t recall, Sherlock had made the casual observation that three young women had gone missing after visiting Bloom. In a rather cavalier manner, he confesses to killing two of the young women and hiding their bodies, but states that the third was his wife and begs Sherlock to investigate her disappearance. He reveals the location of the two bodies, and then shockingly proceeds to shoot himself in the head in front of Sherlock. Sherlock’s character development over the last three seasons has been remarkable, and in this episode we have the opportunity to see how far he’s come when he attempts to make reparations for his recent relapse. Far from his usual arrogance, we see the humility he would have learned from the twelve-step program as he bids farewell to Captain Gregson and Detective Bell. Hopefully these goodbyes don’t turn out to be permanent, but as of the end of the episode, their relationship with the NYPD seems to be terminated for the foreseeable future. There is a touching scene when Sherlock informs Joan that they have, in fact, been “sacked” (in spite of the DA’s ultimate decision not to press charges). This moment really serves to highlight what a strong relationship they’ve built, one that has always felt natural rather than contrived for the sake of the books.He reveals his hopes to solve Bloom’s case and give Watson credit, so she might at least keep her job. When she asks Sherlock what he would do, he waves her away, and she responds, “When it comes to what we do, the only thing that matters to me is our partnership.” I can’t be the only one that got a bit choked up at that. I’ve always loved the creative liberties the forerunners have taken with this show, chief among them the fact that they chose to make Watson a woman. Despite that fact, and the certainty that in this incarnation, Sherlock does have romantic inclinations, they have always maintained a purely platonic relationship. Not only that, but one in which they are equals (as opposed to the books, where Watson is perpetually in awe of Holmes). Joan Watson solves mysteries just as often as Sherlock does. She, in fact, has the breakthrough that leads them to solving the case at hand. This partnership is the core of the show, and her determination to follow him is a relief after their previous stint of working separately when Kitty came onto the scene. 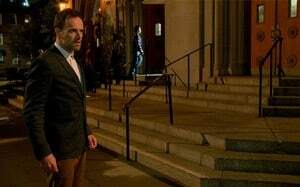 Although this episode may have been lacking in some of the drama we might have expected from this particular season premiere, it still contained all the elements we have come to expect from an episode of Elementary. The case was intriguing, although the appearance of Dexter’s David Zayas made the conclusion rather obvious. The friendly repartee between Watson and Holmes was on par, not marred whatsoever by recent events. And of course, It had the effect of making fans eagerly await next week, to see what the fabled Morland Holmes has in store for our heroes, and what their now-uncertain future may hold.